Over the past few years I've been overseeding my lawn with better quality grass seed to improve the appearance and disease resistance of my lawn. Along with proper mowing, watering and a good organic lawn fertilizer program I have seen big improvements in my home lawn. I just completed overseeding my lawn for the fall and hopefully it will be the last time I need to do so for a while. I got off to a late start but the soil temperature is still above 65 degrees which is very important. Normally I would have liked to start around early to middle September. Before spreading the seed there was a bit of work to get the lawn ready. After edging with my Black and Decker Edge Hog I dropped the deck of my mower down to the second lowest setting possible and mowed the lawn collecting the grass clippings. This was a drastic reduction in height. The reason was to give the new grass plenty of light once they start to germinate. Cutting the grass so much would also stunt the existing grass' growth which would give the slow growing Kentucky bluegrass seed some time to establish without having to compete with the existing grass as much. After mowing the lawn I used my thatch rake. I didn't have a lot of thatch build up but it is important to have good seed to soil contact and dethatching helps in that matter. There were also some areas where I had to use the thatch rake to remove ground ivy and clover. The thatch rake took care of it quickly and easily. The thatch rake is adjustable and I tilted the head back to make deeper cuts in the soil. Not only was I dethatching and removing ground ivy and dutch white clover but I was loosening and cultivating the soil which would help the seeds germinate. The thatch rake also makes it easier to spot some weeds such as crabgrass that you might other wise miss. As I went along with the thatch rake, I kept my Weed Hound handy to pull out any weeds I found. Sometimes I could just pull them out by hand since the thatch rake had loosened the soil so much. I also pulled out some of the tall fescue that has grown in one portion of the lawn but I don't think I got it all. I use a Scott's Accugreen Drop Spreader. Jonathan Green has appropriate spreader settings for Scotts Rotary and Drop Spreaders on their website. They have rates for overseeding and for seeding a new lawn. Since I exposed a lot of bare area with the thatch rake and low mowing I decided to use the new lawn setting, in fact I went even heavier with the grass seed. Birds will wind up eating some and some won't germinate so I didn't mind adding a little extra seed just in case. I set my spreder to a little more than half the new seeding rate for the seed I was using then made two passes over the lawn, one north to south, the other east to west. After that I went over some of the bare spots a few more times. This ensured I got even coverage at a rate slightly higher than the normal seeding rate. Once the seed was down I used the back of a regular leaf rake to help work the seeds into the soil. Then it was time for a good watering to soak the seeds and soil. After which I mixed up a batch of Organica Plant Growth Activator Plus in my Orth Dial-N-Spray hose end sprayer and applied it to the newly seeded lawn. 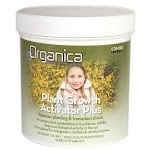 Organica's Plant Growth Activator contains a number of beneficial microbes as well as other ingredients that I found seem to help when seeding. It's something I apply every month throughout my garden on everything. It's a good idea to apply a fertilizer at the same time and lime if you need to adjust your soil's pH. My soil pH is finally in a good range but I just ordered some Espoma Bio-Tone Start Plus to apply to the lawn. In addition to being a 4-3-3 organic fertilizer it contains many important microorganisms including mycorrhizae which are fungi that colonize on plant roots which help them absorb water and nutrients. It is applied at 25lbs per 1,000 sq ft of lawn. The next step would be to add a 1/4" layer of a good, screend compost over the lawn. That's about 1 cubic yard per 1,000 sq ft. This will help cover the seeds, keep them moist and provide nutrients. Unfortunately I don't think I'll be doing it this year because of time and cost considerations. I don't have a large enough property that I can get bulk compost delivered cheap and buying bags of compost would be expensive. I might change my mind if I can get some extra time and set aside the extra money. Keeping the seeds moist is crucial. If the seeds dry out they won't germinate even if you water them the next day. Up until the seeds begin to germinate, the first 4 weeks or so, I will be watering for 10 minutes 3 times a day at 9:30 AM, 12:30 PM and 4:30 PM. After the first 4 weeks I'll cut back to 2 times a day at 9:30 AM and 3:30 PM and slowly work my way back down to a normal lawn watering schedule. This time of year in this area there should be quite a bit of rain and in between I'll be using my hose end sprinklers and timers. In addition to the starter fertilizer, I'll be applying an organic fertilizer once the lawn has established to provide it with food that it can store up over the winter so that come spring time, the lawn is thick and healthy.